Mrs. A’s Salsa Buena is All Natural. It contains no additives, preservatives, added salt or artificial ingredients. Find Mrs. A’s Famous Salsa Buena at a store near you: store locations. Contact Mrs. A about classes she teaches in the Bay Area. Mrs. A, as she is known to her students, has an important place in their hearts for a lot of reasons. She is a good listener and is available to her students for personal chats. Every year, a "Souper Bowl" fundraising event is organized with the school's culinary club. Hundreds of handmade bowls are made in Leah’s classes, and participants have a soup supper, after which they get to take home the bowl they used. "I care about my students, and I want them to know that," said Aguayo, who moved to the area to attend UC Santa Cruz with her husband Rafael in the 1970s. "I’m here to embrace their hopes." In turn Leah’s students have enthusiastically supported her new venture, both with their encouragement and with their own skills. Her class helped her come up with the salsa’s name; Ed Chow, one of her students, designed the sun at the center of her logo; and another student, Daniel Yang, designed the product’s label. Most importantly to Leah, she also went through the long and arduous process of getting her salsa certified organic. All her efforts, combined with a product that was already “famous” with her students, paid off. At the start of 2004 Mrs. A’s Salsa was in stores. When it came to marketing Mrs. A’s Salsa Buena, she had many allies among her formers students. One is the buyer for a grocery store and was able to place her product in the refrigerated section of the store. 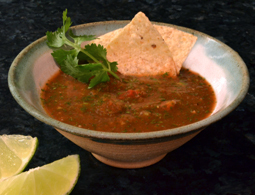 The family of another student gave her valuable advice and assistance in finding a commercial co-packer who would maintain the flavors and quality that were crucial to her salsa. "Rafael and I have invested money from our savings in that container of salsa that I demo and sell on Saturdays," said Aguayo, who has no plans to give up teaching. "I know we’re just this little guy, but I’m very proud of our salsa."